The Zip It Wallet with six cash envelopes was designed in response to customers who need loose envelopes not bound into a wallet. The zippered pouch holds six money envelopes which each measure 7" x 3 1/2" and which come with blank durable & erasable category labels that can be labeled with a permanent marker. (See photo #4.) I recommend an ultra-fine Sharpie. 2. Select your fabrics (one for the main pouch and up to three for the individual envelopes) using the link above and type your choices in the note at checkout so that the processing of your order is not delayed. There is no option for choosing from a list at checkout. I regularly update fabrics, but there may be occasions when a fabric becomes unavailable as a result of other orders placed during the day, so it's always good to have a second choice in mind. 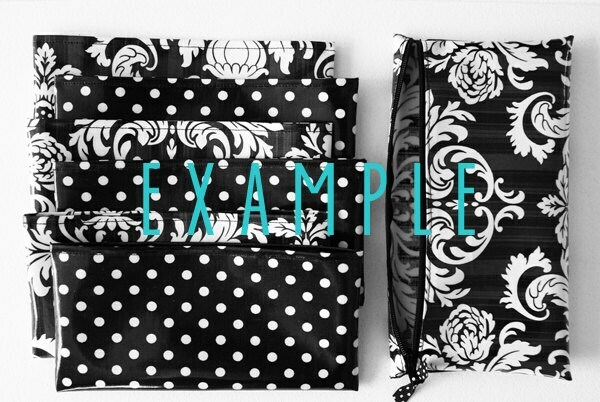 You are also free to request a particular zipper color for the pouch, but if it's not available, I will select another one that coordinates with that fabric. 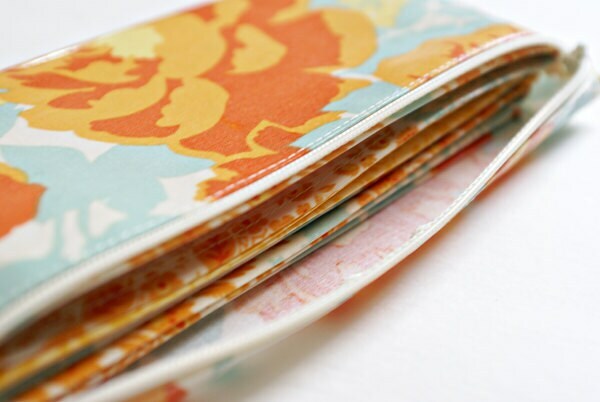 All pieces of the wallet are constructed with designer laminated cotton that can be wiped clean. You get the beauty and uniqueness of a fabric wallet without the inevitable grunginess that results from regular cloth kicking around in your purse and being handled. 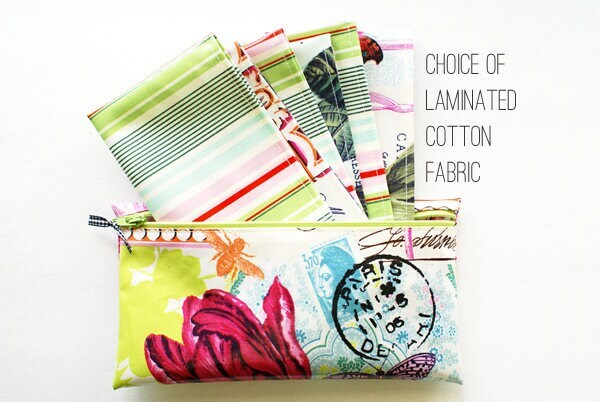 Laminated cotton is lightweight yet very durable, and unlike oilcloth, it is CPSIA compliant and contains no BPA, PVC, or phthalates. Please note that the individual envelopes are not zippered. If you would like to make one or more envelopes hold two budget categories, our sturdy tabbed dividers fit perfectly and can even be requested without the tabs. Please convo me to set up a custom listing for adding dividers and extra labels to your order ($1.00 for one divider and one label). Alternately, you can contact me about purchasing extra category envelopes. This is a custom order and will be added to my processing queue and ready to mail within 2 weeks. © Copyright 2011-2019 Melissa Kaiserman. All rights reserved. Love all of these products! Very well made and very nice to deal with!!! Great item. I can't wait to start my budget and use it. Exactly what I ordered. Shipping was great, shipped when it said it would and arrived promptly.